Respected wine sommelier Michael Tamburi will lead a food and wine soiree along the magnificent Kimberley coastline in August. 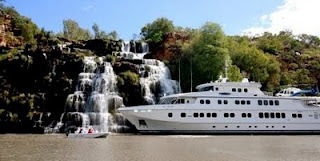 Mr Tamburi, who has owned and operated Perth's La Vigna fine wine outlet for 22 years, will join a two-week Kimberley Wilderness Cruise departing August 14. North Star Cruises General Manager Peter Trembath said Michael would add a new and exciting dimension to the cruise. "Michael will be sharing his amazing wine knowledge with our guests who will also enjoy gourmet produce including a bounty of freshly caught fish," said Mr Trembath. "Michael is a respected wine educator, national judge and media commentator." "It will be an exclusive experience which will result in a very special Kimberley Wilderness Cruise indeed!" As an added bonus, guests who book a two week Kimberley Wilderness cabin before June 30 will also receive either four night's accommodation at the Cable Beach Club Resort & Spa or, a Linneys gift voucher valued at $2000. Kimberley Wilderness Cruise prices start from $10,495 (one week trip).